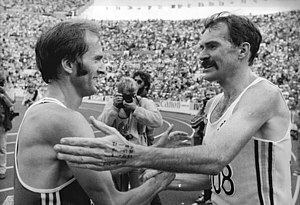 Robert de Castella (‘Deeks’) is arguably Australia’s greatest marathon distance runner. And he sports a champion moustache. Movember is a campaign that runs throughout November where men can help to change the face of mens’ health by growing a moustache to raise awareness of depression among males and the prevalence of prostate cancer. During November, I am participating in Movember having formed the team: Deeks Mo-Marathon. While I am out running across bridges I will be cultivating a ‘mo’ modelled off Deeks. I am not sure it will make me run any faster, but it will be a source of inspiration. More about this during the month. If you want to join the team as a Mo-Bro or Mo-Sista please leave a comment or email me directly. This entry was posted in Awareness, Movember, Robert De Castella and tagged Moustache, Movember, Robert De Castella. Training log: October- Pain and Doubts. Running into uncertainty.